The 22-250 Remington cartridge is generally thought of as being a long-range varmint round. Due to its high muzzle velocity, it excels in this role when compared to smaller 22-caliber cartridges such as the 223 Remington and the 22 Hornet. What makes this round more versatile than you might think is its kinetic energy of 1600 ft-lbf at the muzzle. With the correct ammunition, this cartridge is a terminal ballistic twin of the 30-30 Winchester and the 7.62x39mm cartridges. Neither cartridge can practically match the 22-250 Remington velocity so the terminal effect with varmint bullets on varmints cannot be replicated. Just the same, limited expansion soft point bullets enable the 22-250 to hunt small to medium game ethically. The driver of a bullets ability to penetrate is its sectional density and kinetic energy at impact. Since we have already seen that the kinetic energy is comparable between cartridges, lets take a look at how the three cartridges sectional density stacks up (see Figure 1). 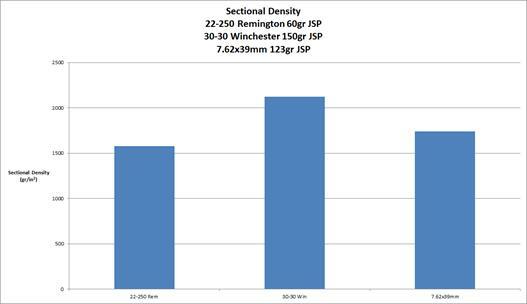 The 30-30 Winchester is the sectional density winner here but the other two cartridges are close behind. It is important to know with the 22-250 Remington, using heavy soft point ammunition, to place your shots directly broadside to the target where the vital organs are located closer to the skin. More recently, intermediate rifles have become popular with civilian gun owners for the purpose of self-defense. While bullet penetration depth is important, a bullet that overpenetrates the target can be said to have wasted some of its potential to damage the target. This is why in the 1980s-era Hollywood movies you would see one of the actors get stitched and then he would calmly say “it’s ok—it went in and out”. This popular assumption was that, if the bullet exited the body that some (most?) of the bullets kinetic energy was not expended wounding the target. But if it stopped in the body—Katie bar the door … much damage would then be assumed to have occurred. What the movie characters did not identify were the organs that got damaged by the bullets passage through and then out of his body. In any event, most rifle soft points will exit the target even when full expansion occurs. You can partially remedy this situation by using ‘varmint’ bullets that will fragment into many small pieces upon impact. The problem with varmint bullets for self-defense is that the size/weight of the fragments is not large enough for each fragment to penetrate deeply in the target or to make large enough holes in the organs that it does come into contact with. What is needed is a smaller diameter bullet, light-for-caliber, that stops at 12” penetration depth in 10% ballistic gelatin. For self-defense and medium game hunting, I recommend that you use the heaviest soft point ammunition that you can find. There is much to be said about proper bullet weight selection for varmint hunting. Let's use some data points from Federal Cartridge below to see what our desired bullet weight is for our anticipated hunting engagement distances (see Figure 2). 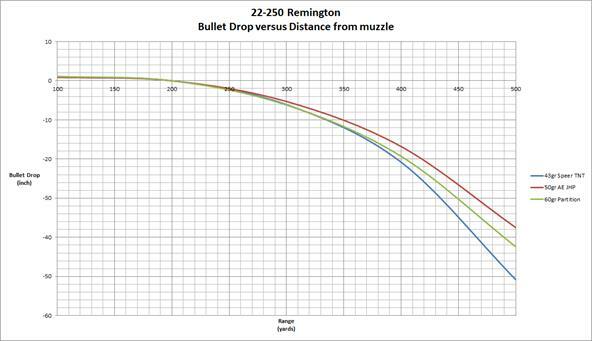 It is possible to switch bullet weights and shoot to 250 yards without any consideration giving to adjusting your scope for elevation when using a 22-250 Remington. This versatility makes this cartridge favorable in situations where the ammunition supply is spotty and time for preparation is short.